This post is about the best restaurants in Sarajevo on a budget. Sarajevo is one of my favourite cities in Europe and one of the reasons is its great Bosnian food. In this post I like to introduce you to the best budget restaurants in Sarajevo and where to go for cheap eats in the city. 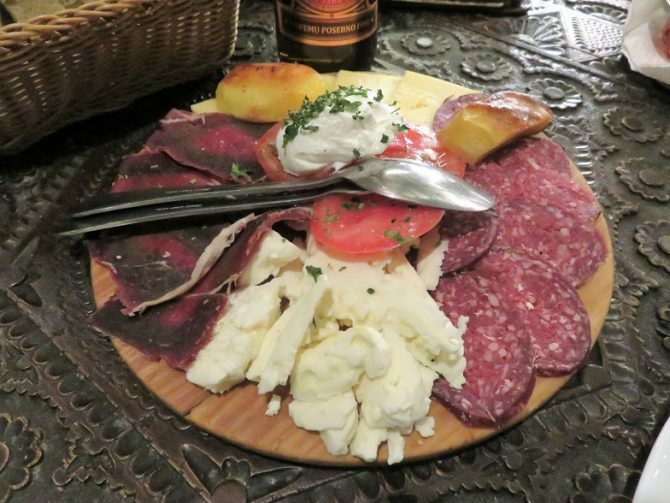 Have you ever heard of Bosnian cuisine? I hadn’t and I was positively surprised about the restaurants in Sarajevo and the traditional food they serve. Sarajevo is a great city for people that appreciate a good meal and want to try the local cuisine. Bosnian recipies are hearty, delicious and flavourful with fresh herbs and spices. If you know where the best restaurants in Sarajevo are, you will find homemade food cooked by perfection like only grandmothers can do. The good thing about restaurants in Sarajevo is that they are incredibly cheap for a European capital. After several visits some restaurants in Sarajevo kept me coming back for more. This list of the best restaurants in Sarajevo to go for cheap eats is based on my own experiences and I haven’t received any favours for making this post. Inat Kuca translates as house of spite and is my number one among the best restaurants in Sarajevo. Not only is the food great, but it also has an interesting history. At the end of the 20th century Sarajevo wanted to built the City Hall next to the river, but got into trouble with the property owners. One of them refused to move and requested his house to be rebuilt stone by stone in its original form opposite the river. Since then it has become a symbol for Bosnian stubborness, defiance and perseverance. Nowadays, it is a restaurant with the best traditional food in Sarajevo. You should try the starter of Bosnian meats and the mućkalica, a meat stew with vegetables. Location: Inat kuca is opposite the City Hall. Zara iz duvara is another great restaurant in Sarajevo for traditional food. However, they give their own twist to their recipies by using local herbs from the mountains. Nettle is their trademark, because of its healing properties. They have a creative and original menu that makes you regret you only have one stomach. The house specialities we tried were all delicious. I can really recommend the nettle juice, the homemade bread with nettle and the ravioli with nettle pesto. Location: Zara iz duvara lies around the corner from the Sarajevo market. Dveri is a nice restaurant in the bascarsija serving some of the best meat dishes in Sarajevo. The interior has nice decorations and people are very friendly. The sopska salad makes a great starter before you fill yourself with delicious chunks of well grilled meat. The cheapest way to eat in Sarajevo is to visit an ascinica, which basically means a place to eat. They don’t offer high cuisine and have basic services. However, locals come here for simple, traditional and filling meals. Ascinica Hadzibajric is one of the oldest ascinica’s in Sarajevo. Even though, they are in the middle of the Bascarsija it is easy to miss the small entrance. There is no menu, but you can choose from the pots and pans on display. Cevapcici is the balkan version of kebab and probably the most popular snack in sarajevo. It is eaten in greasy pita bread with raw onions, some tomatoes and coleslaw. If you like a quick and cheap lunch, cevapi is the way to go. There are plenty of places to eat them, but Cevabdzinica Zeljo offers some of the best right in the bascarsija. I was in doubt whether to include Park princeva among the best restaurants in Sarajevo. To be honest, park princeva is not the cheapest option and the food is forgettable. However, they do offer the best view over the city. In addition, if you consider the location and the excellent service, the prices are still reasonable. I can recommend the palacinke with walnuts and honey for desert. Location: Park Princeva is up the hills at Iza Hidra 7. Because it is difficult to find it is better to take a taxi. The best place to have tea is at Dzirlo’s cajdzinica. It will be hard to choose from the extensive menu of herbal teas. The owner that looks like a wizard from Harry potter can advise you on the best tea for you. For everything about Tito head to café Tito near the history museum. The cafe is almost a museum in itself and will let you travel back in time. Some will say the good old times. For now it is the place to have a good cup of coffee or tea after you visited the history museum. Location: Café Tito is next to the history museum. Last, but not least is slasticarna Palma. It’s a bit far from the centre, but it has a huge variety of mouth watering pastries and huge cups of Lipton tea. Slasticarna Palma is a local secret and you are likely to be the only foreigner around. To read more about everything that there is to see in Sarajevo, please read my post about Sarajevo: where east meets west.